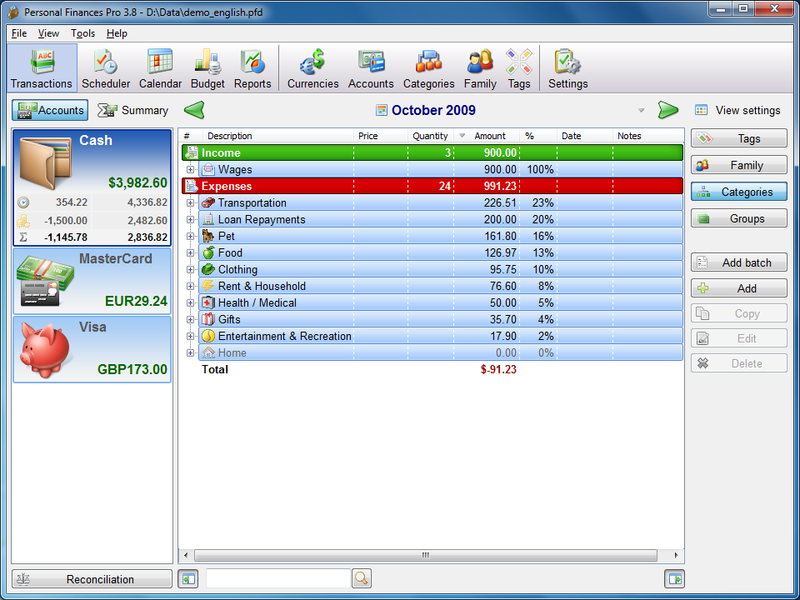 Personal Finances Pro is an elegant, super easy Personal Finance application for home users. With a glance at its summary view, reports and graphs, the user will gain deep insight into the financial health of the Family Budget, PinPoint areas of excessive expenditure and trim the budget. Featuring the scheduler, Personal Finances Pro also enables you to track expected income, spending and see how much money you'll have at a future date. ...... Novice users can learn how to track budget much quicker than with advanced online personal financial systems. Making and maintaining the budget in this application is a matter of a few steps. The first step is to add accounts, such as bank account, credit cards, and cash. The second step is to set up categories. It will allow the user to categorize and sort expenses and income and review financial information in a meaningful way through reports. The third step is to enter transactions, in other words, everything you earn and purchase, transaction by transaction. Transactions can be identified by categories, family members, and tags. Thanks to the easy-to-navigate design, the majority of data entry and budget tracking operations is less than a couple of mouse clicks away. * Set up any number of different accounts, such as credit card, checking account, savings, cash. Qweas is providing links to Personal Finances Pro 5.0 as a courtesy, and makes no representations regarding Personal Finances Pro or any other applications or any information related thereto. Any questions, complaints or claims regarding this application Personal Finances Pro 5.0 must be directed to the appropriate software vendor. You may click the publisher link of Personal Finances Pro on the top of this page to get more details about the vendor.